Dr. Tara Ghaziani, MD, is an Instructor in Medicine at Harvard Medical School, Division of Gastroenterology/Liver Center and Liver Transplant Institute at Beth Israel Deaconess Medical Center (BIDMC). 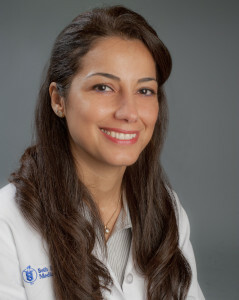 Dr. Ghaziani did her residency at Cambridge Hospital and gastroenterology and liver transplant fellowship training at the Beth Israel Deaconess Medical Center. Her clinical responsibilities include patient care and teaching in the Liver Center, Liver Transplant Clinic, and inpatient service for patients with complex liver diseases. Her research interests include understanding the cellular mechanisms of liver fibrosis and cirrhosis.